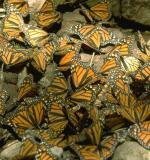 AMES, Iowa — Although the number of monarch butterflies overwintering in Mexico has sharply rebounded, leaders of the Iowa Monarch Conservation Consortium, say that sustained efforts of Iowa crop and livestock farmers, landowners, conservationists and others are critical to ensuring continued improvements to monarch conservation. Last Friday, the World Wildlife Fund, announced that this winter’s survey reported that adult butterflies covered approximately 10 acres of forest in Mexico. During the last three winters, overwintering butterflies occupied three or fewer acres. This past year, the U.S. set a conservation goal for a sustained monarch population of about 15 acres, or 225 million butterflies through domestic and international efforts and public-private partnerships. Blodgett added that the ongoing, collaborative conservation efforts of the Monarch Consortium’s members in Iowa will play a key role in helping to ensure the population response noted this winter can become part of a positive trend for the future. Read the full news release from the Iowa State University College of Agriculture and Life Sciences.